The aim of this single-center randomized trial was to compare the perioperative outcome of pancreatoduodenectomy with pancreatogastrostomy (PG) vs pancreaticojejunostomy (PJ). Randomization was done intraoperatively. PG was performed via anterior and posterior gastrotomy with pursestring and inverting seromuscular suture; control intervention was PJ with duct–mucosa anastomosis. The primary endpoint was postoperative pancreatic fistula (POPF). From 2006 to 2011, n = 268 patients were screened and n = 116 were randomized to n = 59 PG and n = 57 PJ. There was no statistically significant difference regarding the primary endpoint (PG vs PJ, 10 % vs 12 %, p = 0.775). The subgroup of high-risk patients with a soft pancreas had a non-significantly lower pancreatic fistula rate with PG (PG vs PJ, 14 vs 24 %, p = 0.352). Analysis of secondary endpoints demonstrated a shorter operation time (404 vs 443 min, p = 0.005) and reduced hospital stay for PG (15 vs 17 days, p = 0.155). Delayed gastric emptying (DGE; PG vs PJ, 27 vs 17 %, p = 0.246) and intraluminal bleeding (PG vs PJ, 7 vs 2 %, p = 0.364) were more frequent with PG. Mortality was low in both groups (<2 %). 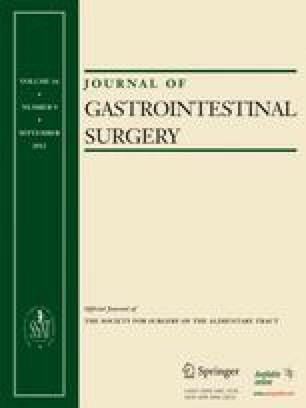 Our randomized controlled trial shows no difference between PG and PJ as reconstruction techniques after partial pancreatoduodenectomy. POPF rate, DGE, and bleeding were not statistically different. Operation time was significantly shorter in the PG group. This trial is registered in the German Clinical Trials Register (trial ID DRKS00000419), initial trial registration as UKF000532 on March 15, 2006. This trial has been financed from institutional sources. Analysis of this trial was in part supported by financial support of the German Research Foundation (DFG) for the RECOPANC trial (DFG Ho 810/3-1). We thank Joachim Wellner, MD for the artwork of this article.